You can make whimsical birdhouses for the inside of your home. You can make them for a focal point or just as an accent. They are so cute and people will be fascinated with them. You can find unfinished birdhouses at craft stores or even at craft shows. 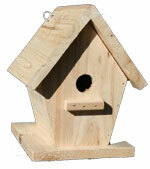 Some nature centers will sell the cut wood pieces to build your birdhouse and will even furnish the instructions. Thrift stores are also a place to look. You may find some there that are already painted but you can paint over them. If your birdhouse is unfinished then you need to put a primer on it to seal the wood. Next paint it with your desired colors. I like to use country colors but you may want yours in some bright colors. It all depends on your dÃ©cor. You can paint it with a brush. I like to brush on my base color and then use a craft sponge and dab on a lighter color. This gives depth to the birdhouse. You can even get fancy and paint a scene. I have seen some beautiful birdhouses that are just kind of plain and some that have a pretty scene on them. Now the fun starts! This is where you go through your stash of buttons. Plan out how you want the roof to look. Do you want a solid color for the bottom with different colored buttons on top? I like to just use different colors for the whole thing. Glue your flat buttons all over the roof. I have found the best glue is a craft glue or tacky glue. Once you have the first layer on let it dry. The next layer is were your fancy buttons are used. Use different sizes, shapes and textures to give it a different look. Keep putting buttons on until the roof is completely filled. These little whimsical birdhouses are great gifts and they are fun to make. Just use your imagination and you will come up with a pretty little birdhouse.